The Honolulu Museum of Contemporary Pop presents music from the past 50 years and offers educational tours to school groups and music aficionados. The museum also is used for private parties and events. What do Don Ho, Bette Midler, Cecilio & Kapono, Glenn Medeiros and Bruno Mars all have in common? They’re contemporary music stars with global recognition. And they all have Hawai‘i ties. 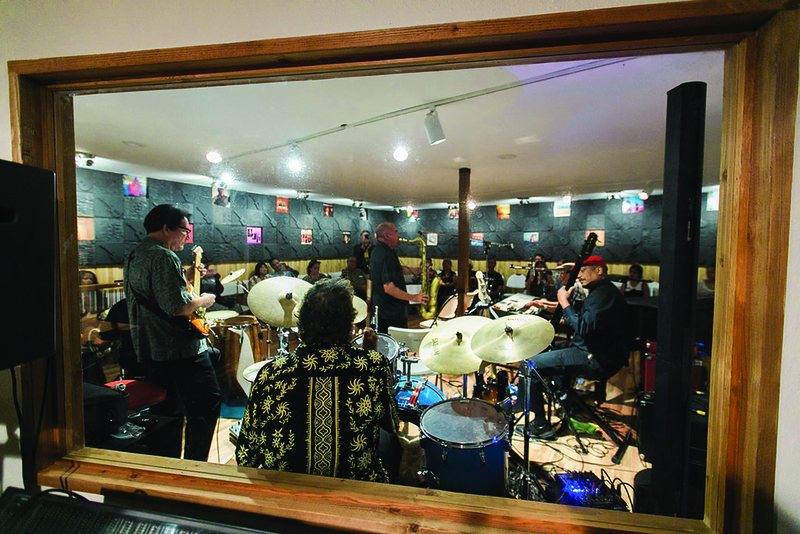 The Honolulu Museum of Contemporary Pop celebrates these local stars and dozens more of the same caliber with weekly, nighttime concerts that take place inside a recording studio located on Beretania Street. The “Inside Session” concerts, performed eight times per weekend, feature the best of Hawai‘i’s contemporary pop tunes over the past 50 years. Jazz, soul, R&B, folk, pop and funk music are part of the nightly mix. What often brings down the house, however, are hit tunes by Hawai‘i’s own Cecilio & Kapono. The brainchild behind “Inside Session” is Kirk Thompson — an original member of the contemporary Hawaiian music band Kalapana and founder of the legendary group Lemuria. “My mission is to document and preserve that movement for the next generation,” Thompson said. During the concerts, Thompson also pays tribute to his good mentors, the late singer Don Ho and concert and music promoter Tom Moffatt. “Tom was such a cool-headed guy, bringing in big concerts like Michael Jackson,” Thompson said. “And I learned a lot from Don and Tom. As a record producer for Don ‘Mr. Aloha,’ he always helped those who wanted to record, and my job was to help him help others do a good job for him,” he said. The pop museum falls under the nonprofit group, Hawaii National Music Foundation of the Pacific. As part of the nonprofit’s mission, Thompson and his team provide educational tours for students and music aficionados of all ages. Tour groups learn about the recording industry, receive tips from the pros and even take shots at recording their own music. Lining the wall of the museum are more than two-dozen record albums, dubbed the “Pioneers of Pop” exhibit. Visitors are invited to take self-guided tours of the wall, using state-of-the-art, multilingual tablets.